Nobel Chad Prize | Comics I Don't Understand - This site is now being updated daily at http://www.comicsidontunderstand.com. Please change your bookmark if necessary, and notify any web site with a link to the old address. Click more to see them, plus one sent by Autumn Harvest — though for all practical purposes, they’re all the same comic. So, here’s the question: When these cartoonists draw the Supreme Court taking away Al Gore’s Nobel Peace Prize, do they somehow believe they’re being stunningly clever and original, or do they just consider it obligatory to churn out their own version? Could be lag time between their creation and their being published. Lola, I’m pretty sure political cartoons have no real lag time — otherwise, they’d always be two-to-three weeks behind the news the way newspaper comic strips are. This is a big reason why I don’t really like editorial cartoons. There will be people who embrace the cartoons as a great expression of free speech. Yet in my experience 90% of them all say the same thing because editorial cartoonists have somehow evolved to the same lame sense of humor that was hardly novel in the first place. I got rather ticked at one cartoon that was supposed to be a commentary on how trivial reality shows have taken over TV. To me, it looked like the artist was making a flimsy excuse to illustrate his “awesome” caricature of Britney Spears. Hey, where’s mine? I sent you one too. I know. And I can’t find it! It’s called “the echo chamber” for a reason. Hmmm — that really is a good question Bill, the answer would depend on when the comic drawn. If I remember correctly there were similar cartoons when Gore won the academy award. I think there are a lot more this time around because he wan the Nobel PEACE prize, and the current occupant of the White House seems to have a penchant for war. 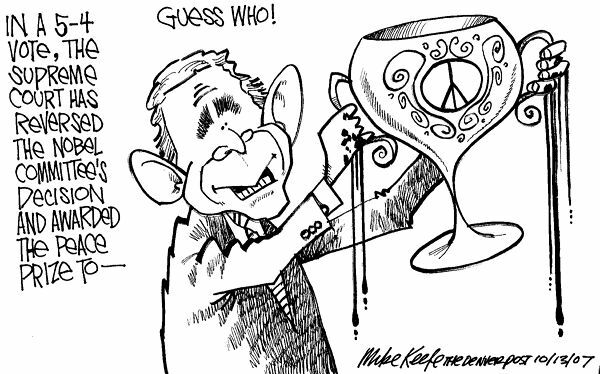 As another illustration for this phenomenon — look around at how many cartoonists are awarding Bush the Nobel War Prize. The main point we had to go through was Gore _did_not_ win an Oscar. He gave an acceptance speech for an Oscar he didn’t win. The Oscar was awarded to Davis Guggenheim for his movie “An Inconvenient Truth”. #8 — Thanks for that link! By the way, I don’t want to start a flame war here or anything, but I’m really surprised that none of the featured cartoonists in the msnbc link pointed out the weirdness of getting awarded a Peace Prize for something to do with Global Warming. I’d expect an issue like Global Warming would be awarded the Nobel Prize for Physics, but … isn’t Peace kinda stretching it a bit? Especially with all the notable humanitarians operating around the world? Again, I don’t want to start a flame war, but I’m surprised there wasn’t at least one cartoonist to pick up on it. There is nothing at all weird about a Peace Prize related to global warming. They didn’t win for discovering global warming (the basic physics have been understood since the late 19th century), but for publicizing it. Gore and the IPCC won “for their efforts to build up and disseminate greater knowledge about man-made climate change, and to lay the foundations for the measures that are needed to counteract such change. “Indications of changes in the earth’s future climate must be treated with the utmost seriousness, and with the precautionary principle uppermost in our minds. Extensive climate changes may alter and threaten the living conditions of much of mankind. They may induce large-scale migration and lead to greater competition for the earth’s resources. Such changes will place particularly heavy burdens on the world’s most vulnerable countries. There may be increased danger of violent conflicts and wars, within and between states.” — The Norwegian Nobel Committee. The Peace Prize is often awarded for unfinished efforts. I think Nicole’s hit it on the head and all of these cartoons were drawn, but not printed, on about the same day. Some cartoonists are on the job five days a week, but others do a week’s worth at a time but are ‘on call’ to provide a timely cartoon should breaking news occur and require one. This happens with movies as well. One movie on a specific topic comes out, and suddenly there are half a dozen movies in the theatres on the same topic. Everyone assumes that the subsequent films are copycats, yet the movie that was released first may not have been the first one written or shot.